FLORA, Mississippi – Primos Hunting, a pioneer in game calls and hunting accessories, has long been at the forefront of innovation that improves the hunting experience. Now, Primos is setting a new standard for a hunter’s best friend with its entry into the hunting dog market. Primos’ new premium, one-piece roto-molded dog kennel is a significant step up in performance and features. Go light, hunt hard with the new KennelUp dog kennel. Primos’ Ben Brettingen is an avid upland and waterfowl hunter from the Midwest and has been a part of the project since Day 1. When he joined the Primos team, Brettingen helped identify a major gap in the current hunting dog market. The new Primos KennelUP Dog Kennel is ultra-durable yet lighter than competitor products. At just 37 pounds, the KennelUP is light enough for one person to load and unload quickly and easily. 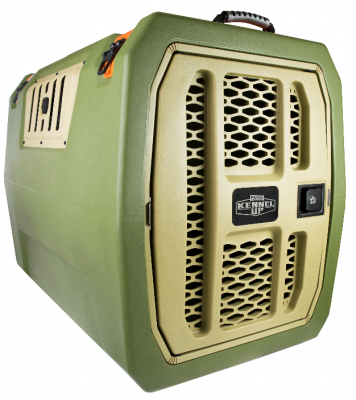 This premium kennel is designed to give you piece of mind, and protect the hardest working hunting buddy you have. The lockable door is reversible to open to the left or right, without tools or disassembly. Built-in wash-out drains, heavy-duty handles and non-slip rubber feet make it the easy-to-load, easy-to-clean, long-term solution for the even the hardest working dogs. The KennelUP Dog Kennel is sized for most hunting breeds at 35-by-22-by-26 inches. It will be found at dealers nationwide with a Minimum Advertised Price of $499.99. To see more about KennelUP Dog Kennel and Primos’ full line of calls, blinds, shooting accessories, game cameras and other hunting accessories, visit www.primos.com or watch the YouTube Channel at https://www.youtube.com/user/PrimosHuntingVideo.